According to Ayurveda, Amla is one of the best drug meant for the treatment of viccited Pitta-dosha. The same Dosha is also responsible for hair problems such as hair loss and premature greying of the hair. So Amla in form of oil is of great use in these cases. 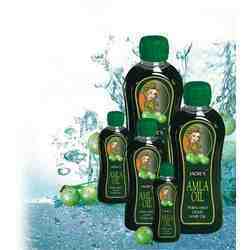 Amla Oil is one of the world's oldest natural hair conditioners. As an Indian herb, amla oil has been used in India since a very long time. As Indian Ayurveda says, it is used as hair oil basically for its cooling effect.